During this august , I will have a long holiday break while working so hard for the coming project and Finally gonna end soon all this nightmares . First stop Definitely is gonna be at a beach , lay back down and spend much more time to relax on the beach drinking coconut . During few years back till now , I will book Flight Ticket and staycation separately to get the great deal but it was tiring . 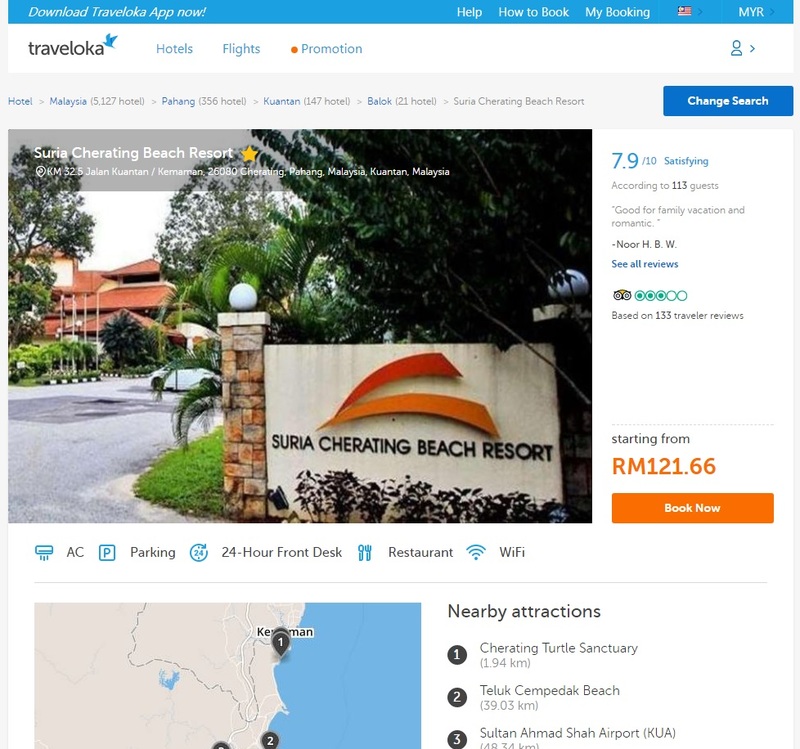 So , I planned together with my family a trip by booking the Suria Cherating Beach Resort that located at Kuantan by boarding on flight From Kuala Lumpur . 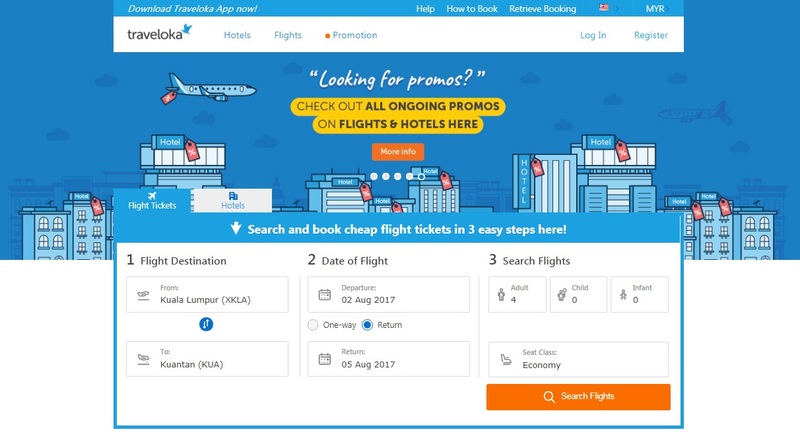 While Scrolling on the browser , Traveloka shown up and pull my attention to click in and found out it's was one of the leading flight and hotel booking platform in Southeast Asia , serving more than 18,000 routes and thousands of hotels in Asia Pacific and to book flights and hotels to my favourite destination . 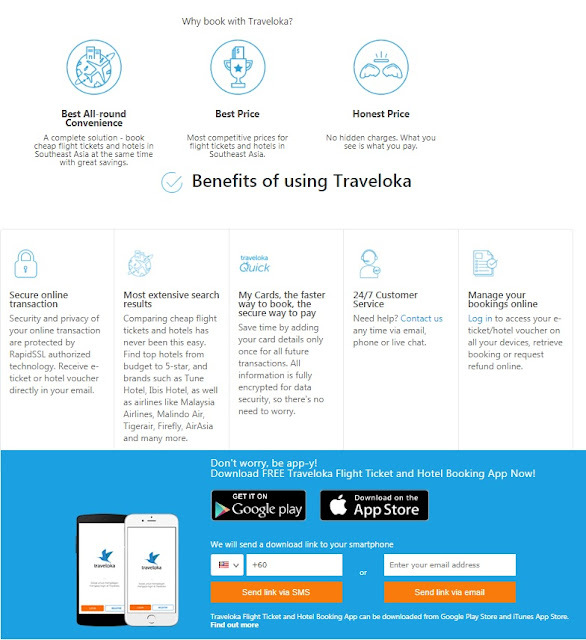 Get cheap flight tickets and hotels on Traveloka website or mobile application . I decided to book Suria Cherating Beach Resort for my three days stay for two room four person . It has the cheapest room I found for 7.9/10 . By key in all the detail that Traveloka needed , Booking detail will appear on the right shows what I had choose and what I will have . 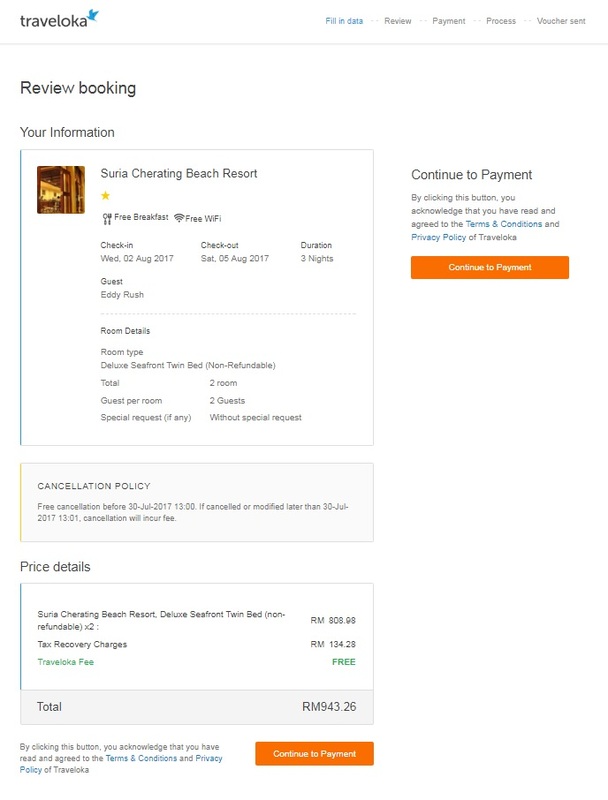 Read at the Cancellation Policy , There is always a free cancellation before seven days to the actual day . 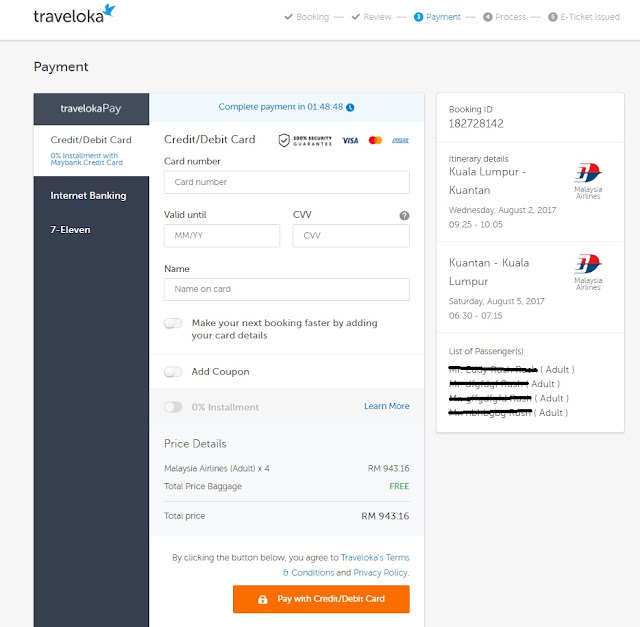 The Total of the amount will shown at the bottom , Price are include Hotel itself , Tax charges like GST or Service charge but Traveloka Fee is FREE . 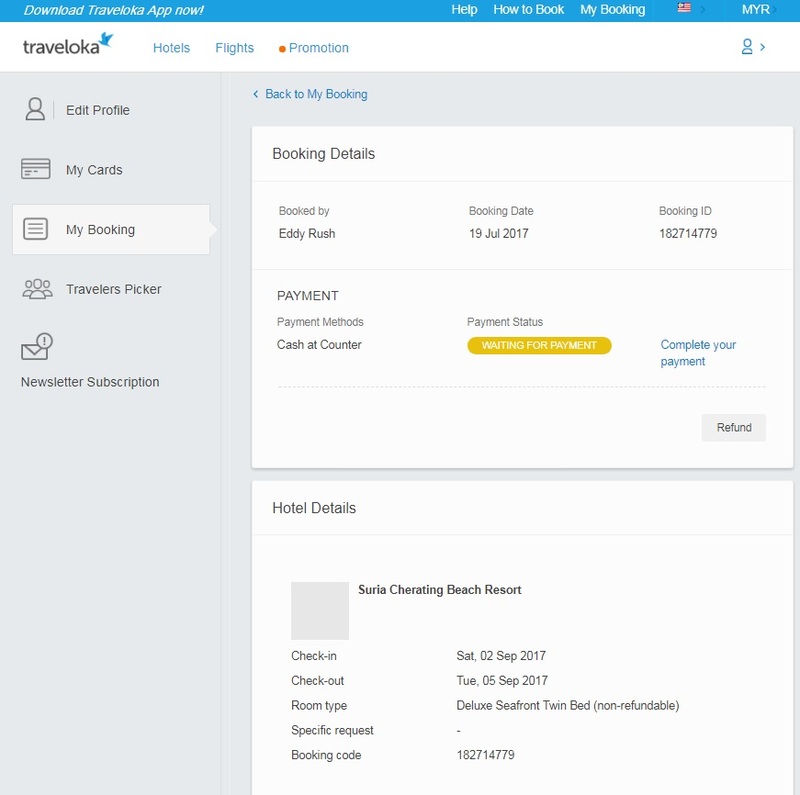 The Pocket Hurt Moment , There was three method to do payment at Traveloka . 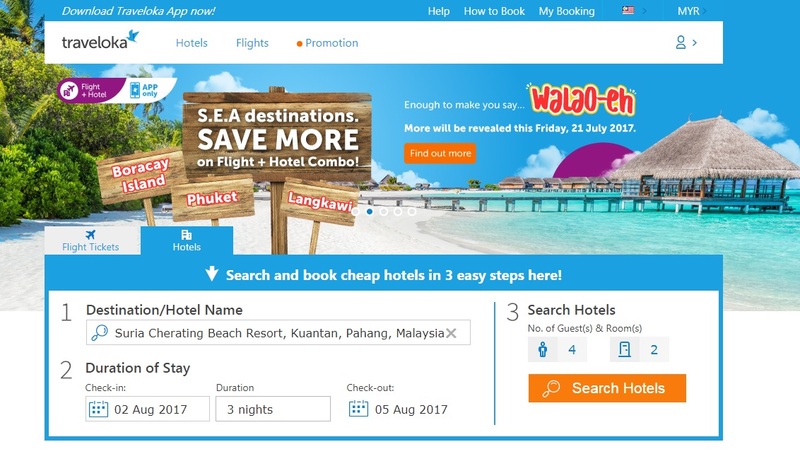 The common with Credit/Debit Card , Internet Banking by Maybank2u , CIMB Clicks , Public Bank PBe , RHB Now , Hong Leong Connect , Bank Islam , AmOnline and others Bank Panels . For those who Don't have Credit/Debit Card , you can Do cash payments at any 7-Eleven Outlet with MOLPay . Before Completing the payments , Key in Coupon Voucher if you have one . The order was direct to My Booking , There I can check my active booking Conveniently in case I need my Booking ID's . Review back for my Payment Status , Check in - Check out and also Booking code . I choose to pay cash at the nearest 7 Eleven by received my Bar code via email and really convenience . After all set for the hotel booking , Now comes for transportation to reach my Destination . Since it was long hours to travel by Car from Kuala Lumpur to Kuantan , I decide to Choose Flight method that only took 45 minute to reach Sultan Ahmad Shah Airport (KUA) . 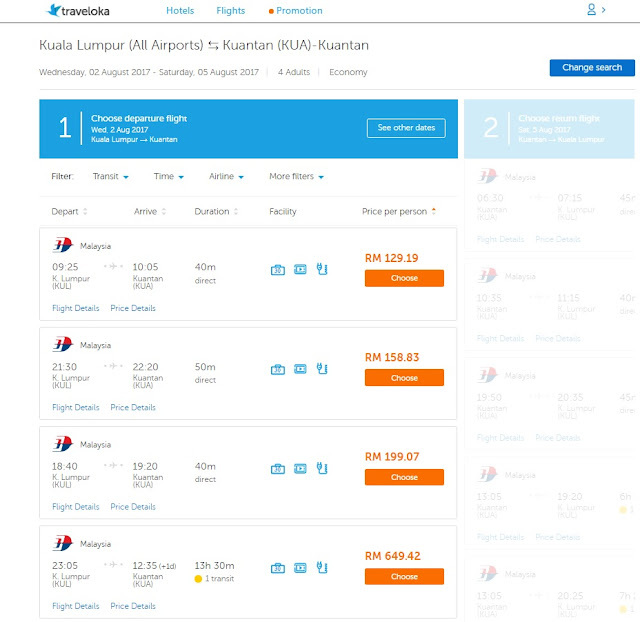 In this case , I was Surprise that Traveloka also Offers Cheap Air Flight Ticket . Let's go through and see how It's work after choosing of my flight destination , date and number of pax . 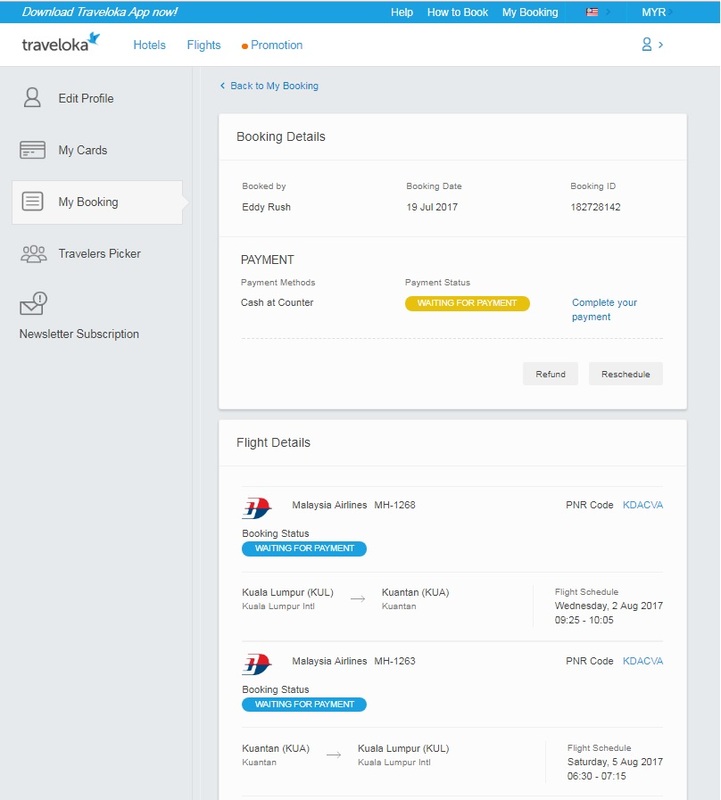 This is awesome , All the Flight ticket price was shown at Traveloka as one stop , There was more than 60 Traveloka Official Airline Partners are ready to serve you . The page shows Airline Options , Departure and Arrival time and most important is the price comparing . " Smart Combo " that stated was sounds like recommended . 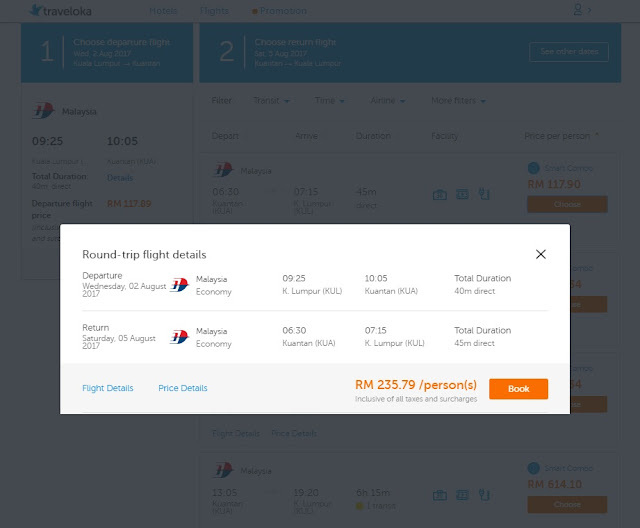 Manage to get RM235.79 per person for Round trip Considered is a reasonable cheap rate , Even getting a bus or car transportation are almost the same expenses but the concern is Hours that we spend for travelling . 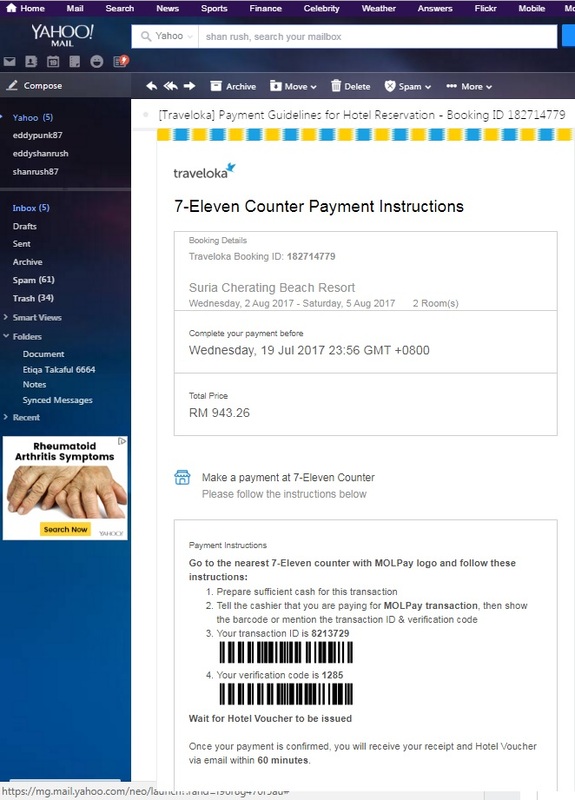 The Payment Method is same like above , There was three method to do payment at Traveloka . The common with Credit/Debit Card , Internet Banking by Maybank2u , CIMB Clicks , Public Bank PBe , RHB Now , Hong Leong Connect , Bank Islam , AmOnline and others Bank Panels . 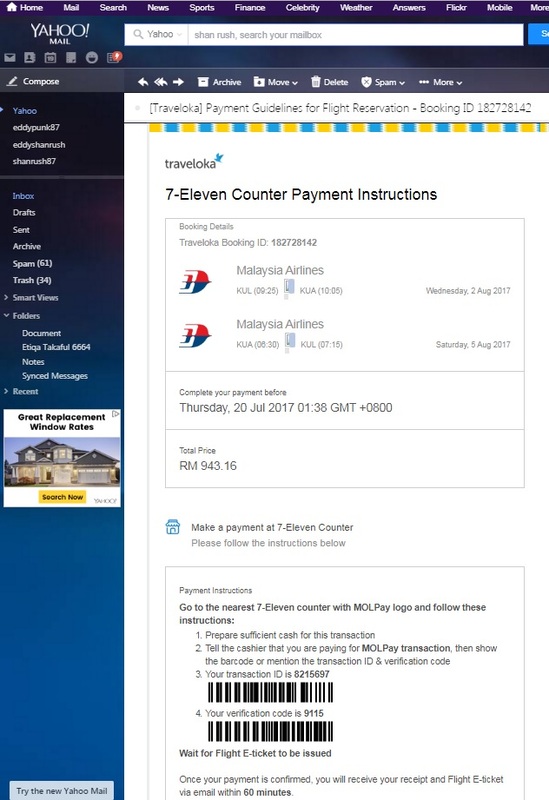 For those who Don't have Credit/Debit Card , you can Do cash payments at any 7-Eleven Outlet with MOLPay . Before Completing the payments , Key in Coupon Voucher if you have one . The order was direct to My Booking , There I can check my active booking Conveniently in case I need my Booking ID's . Review back for my Payment Status , Departure - Arrival and also Booking code . I choose to pay cash at the nearest 7 Eleven by received my Bar code via email and really convenience . Hurray !!! , My Hotel and Flight itinerary Perfectly Done . Now , I can sit back and wait those day to come . Thanks to TRAVELOKA for making the processing of my booking trip and hotel fast and convenience . Alright , Don't let me write too much , Witness Yourself Below . The Traveloka App can be downloaded from Google Play Store (Android) or App Store (iOS) for FREE. The links to download for both smartphone systems are linked as below.